I admit it - I've never heard of the 19th century Russian novelist Ivan Turgenev, much less read any of his books. The closest I ever came was getting about halfway through Anna Karenina by his contemporary Leo Tolstoy (at which point I couldn't bear to read another sentence about the Russian socio-political system). So it was with completely fresh eyes and no previous knowledge that I went to see the new adaptation of Turgenev's novel Home of the Gentry by Crispin Whittell (whose adaptation of A Christmas Carol has played at the Guthrie for the last few years), developed with director Roger Rees (whom fellow TV addicts might know as Cheers' Robin Colcord). In an interview in the playbill, Roger says of the novel, "It manages to be both funny and sad at the same time, and it's inhabited by characters who seem to be able to laugh and cry almost at the same time. I love that." I love that too, but this adaptation is heavy on the funny/laugh, and light on the sad/cry. Still, as a comedy, I found it quite enjoyable. With a great cast playing intriguing characters on an interesting set, with a bit of music thrown in, it's an fun if not particularly deep night at the theater. The Primrose Path takes place in Russia in the mid 19th century. Maria is trying to marry off her daughter Elizaveta (aka Lisa) to the pompous but wealthy Panshin, but Lisa would rather join a convent. Maria's cousin Lavretsky returns home from Paris without his wife - how scandalous! Lavretsky is the opposite of Panshin, a smart, humble, good-hearted man, and therefore Lisa falls in love with him (this was a time when it was OK for cousins to marry, something George Michael Bluth would approve of). The mystery of Lavretsky's missing wife stands between them, an obstacle they think they've overcome, until they find out they haven't. This basic storyline is surrounded by much talking and joking, a little music (including a piano played live on stage), romping through the woods, and skinny-dipping. It felt to me like a Shakespearean comedy, almost a farce with all of the jokes, antics, and falling prostrate on the ground. So I was expecting that our favorite couple would magically get together at the end, as typically happens in Shakespeare's comedies. But that was not the case, and I was left a bit jarred by the decidedly not happy ending. This is a truly fantastic cast, and a nice mix of Guthrie favorites, favorites from other local stages who are new to the Guthrie, and actors from on and off Broadway making their Guthrie debuts. In the latter category, I quite enjoyed Kyle Fabel as Lavretsky, the straight man amidst these over-the-top characters. Smart and stable but with a bit of a solemn air, it's easy to see why Lisa falls in love with him. 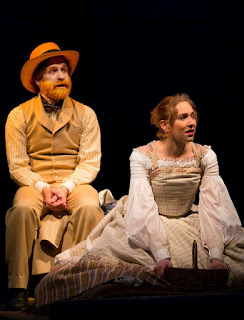 As Lisa, Suzy Kohane (so delightful as the frazzled bride in Company last fall) makes her Guthrie debut and is sweet and genuine as the solemn and serious young woman with the lovely voice. Hugh Kennedy (last seen in the Studio Theater in Buzzer) is, as usual, endlessly watchable as he creates this pretentious idiot of a character, carrying his stiff and proper physicality to the very edge of the stage as he leaves scenes. Broadway actor Jim Stanek made his Guthrie debut in last summer's musical Roman Holiday, and I'm happy to see him return, and to find out that he's just as charismatic this time around. He lights up the stage as Lavretsky's friend Mikhalevich, a lovable rogue. Playing his love interest is Christian Bardin, another local making her Guthrie debut. She's entertaining as the harried maid, but unfortunately the role doesn't allow her to use the full range of her unique comedic talents. The divine Sally Wingert (veteran of over 75 Guthrie productions) is a hoot as the overbearing mother with ambitions of marrying her daughter off "well." Last but not least, Ann Michels steals the scene with her over-the-top performance as Lavretsky's wife, exaggerating every gesture and word, topping it off with a hilariously overdone aria as she takes her stunning voice for a comedic turn. 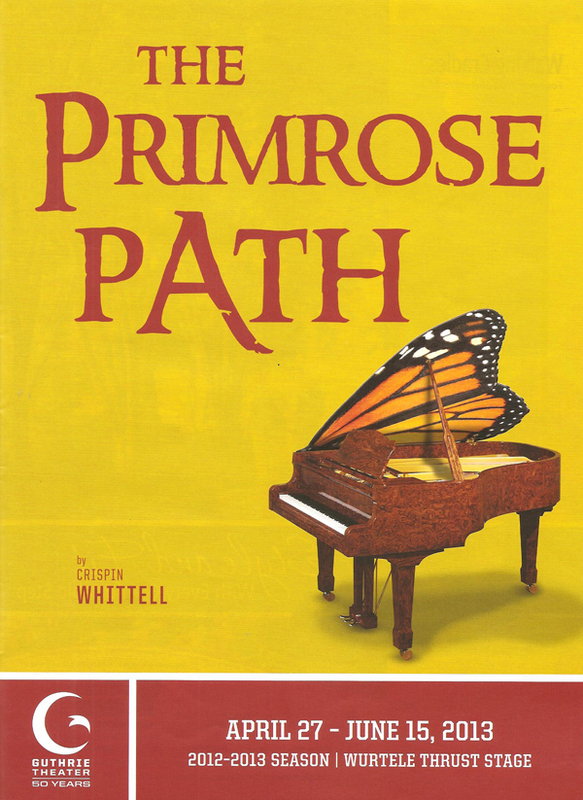 As other reviewers have suggested, the creators of Primrose Path may not have succeeded in their goal of mixing the comedy and heart-felt emotion of Turgenev's novel. Having never read the novel, that doesn't really bother me too much, although as I said the ending left me feeling like something was lacking. But for me, it's enough to watch old and new favorite actors play together on stage. If that's enough for you too, check it out soon - the show closes next weekend (June 8).